Inflammation: The Root of All Disease? Inflammation exacerbates most, and probably all diseases. Normally, inflammation is part of the body's immune response to injury or infection. It helps to kill the pathogens that cause infections, and stimulates the healing process. The problem arises when inflammation becomes chronic. Chronic inflammation eventually breaks down the body and actually facilitates the formation of disease processes. Researchers are now linking inflammation to an ever-widening array of chronic diseases. It has suddenly become recognized as the missing link in the disease puzzle. This new viewpoint is changing the way medical research is conducted. "Virtually our entire research and development effort is now focused on inflammation and cancer," says Dr. Robert Tepper of Millennium Pharmaceuticals. Dr. Paul Ridker, a cardiologist at Brigham and Women's Hospital, adds that just a few years ago "nobody was interested in this stuff. Now the whole field of inflammation research is about to explode." The problem arises when inflammation persists beyond its normal bounds after the healing process has gotten underway, and becomes chronic. Over a period of time it then destabilizes cholesterol deposits in the coronary arteries, leading to heart attacks and strokes. It chews up nerve cells in the brains which leads to dementia and Alzheimer's disease. It can even encourage the proliferation of abnormal cells that transform into cancer. In other words, chronic inflammation may be the engine that drives the most feared illnesses of middle and old age. What can be done to prevent and reverse the damage caused by systemic inflammation? Healthy lifestyle habits such as exercising regularly, not smoking, maintaining a healthy weight, and minimizing stress all help to reduce inflammation. Another important factor in fighting inflammation is the food you eat every day. That's why all the health experts, from diet doctor Barry Sears (The Zone) to alternative medicine guru Andrew Weil (Healthy Aging) recommend an anti-inflammatory diet for everything from weight loss to heart disease prevention. But taking these steps may be insufficient for many people. Most people find it difficult to eat enough fatty fish, or be constantly vigilant in avoiding not-so-healthy foods or activities, to assure themselves that inflammation will not become a problem. Many also need help in reversing a current inflammatory condition. The best way to maintain the level of cellular health necessary to avoid chronic inflammation is through a supplementary protocol. Omega-3 fatty acids excel at quelling inflammation. More than two decades of research has shown that they suppress the production of the chemical messengers of inflammation. When omega-3 is present in sufficient quantities in the cell envelope, the cell is not transformed into an “armed” inflammatory cell – rather it remains “neutral”. 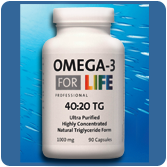 The end result is a dampening-down of the inflammatory process, but without impairment of normal tissue repair (see Omega-3 For Life 40:20 TG). Electrolytes (salts) are critical to maintaining the integrity of the body’s cellular structure. Cells spend considerable energy to maintain a proper pH environment. Whenever a deficiency of electrolytes occurs, cells start to lose their ion equilibrium resulting in significant deterioration and damage. Even slight acid increases cause tissues and organs to become inflamed, eventually leading to chronic disease conditions. 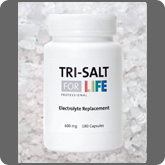 Maintaining a healthy cellular equilibrium can be achieved through the addition of alkalizing electrolytes (see Tri-Salt For Life). 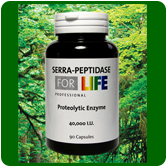 Serrapeptidase is a multi-functional proteolytic enzyme that dissolves non-living tissues such as fibrin, plaque, blood clots, cysts, and inflammation in all forms – without harming living tissue. A striking quality of serrapeptidase is its dramatic ability to reduce pain, by blocking the release of pain-inducing amines. Serrapeptidase has been found to be effective against inflammatory conditions such as arthritis, ear nose and throat conditions, injury-related swelling, sinus and respiratory conditions, vascular conditions, and has been used to dissolve arterial plaque. It works quickly and efficiently, providing patients with prompt pain relief, improved injury recovery times, and relief from swelling, mucous, or fibrous conditions (see Serra-Peptidase For Life). 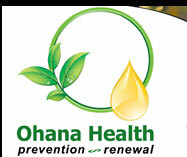 Terms and Conditions / Site Resources © Copyright 2009 Ohana Health. All Rights Reserved.